There was a young gentleman asking about the sort of jobs that involve riding a motorcycle. The 2 most obvious answers are courier and motorcycle instructor. 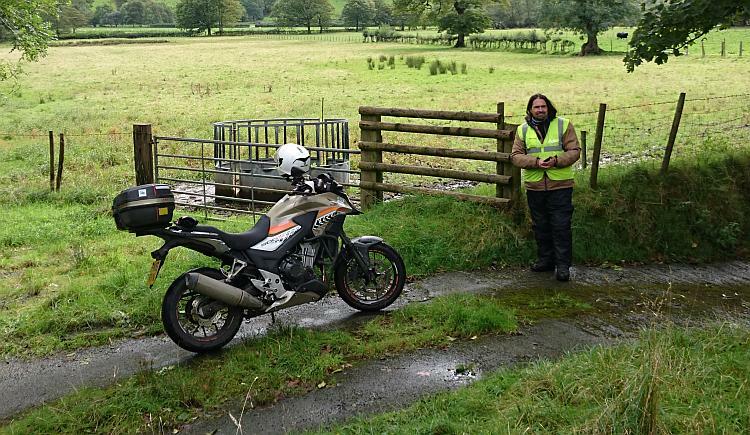 I've done both of these - but would I recommend other keen motorcyclists to do the same? I thought despatching would be the solution to all my woes, the future, my means to becoming wealthy and lots of fun. Being told on a cold Friday afternoon that you have to ride to Manchester Airport to collect 8 letters that need to be delivered to the Greater Manchester, Lancashire, Cheshire and Yorkshire area before you can call it a day is not fun. 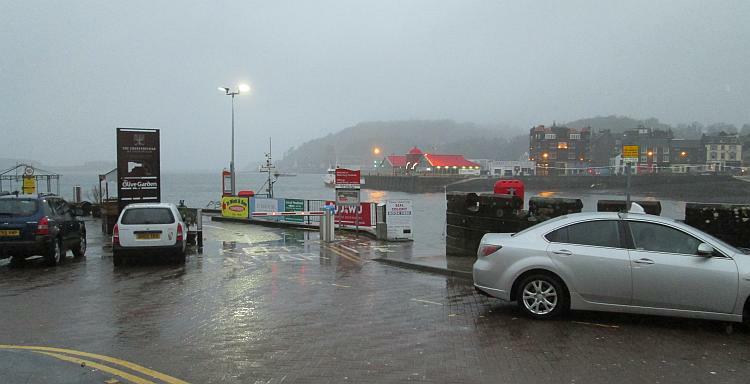 Imagine riding for 6 hours solid on a day like this for a few quid. To do something for a living, day in day out, is to spoil it. I used to look forward to ride-outs on a Tuesday evening with the club but after 145 miles of town riding during the day the last thing I wanted to do was take on an 80 mile blast to Blackpool and back. Riding at the weekend stopped being something I looked forward to and became just like being at work. During this time I'd become a Sunday morning motorcycle instructor, doing CBTs primarily. Happenstance lead to me being offered a full time role and as I was tired of being lost, cold, wet and mile weary I jumped at the chance. Right out of the frying pan and into the fire. Rather than being lost, cold, wet and mile weary on my own I became lost, cold, wet and mile weary with other people who were struggling to ride a motorcycle. 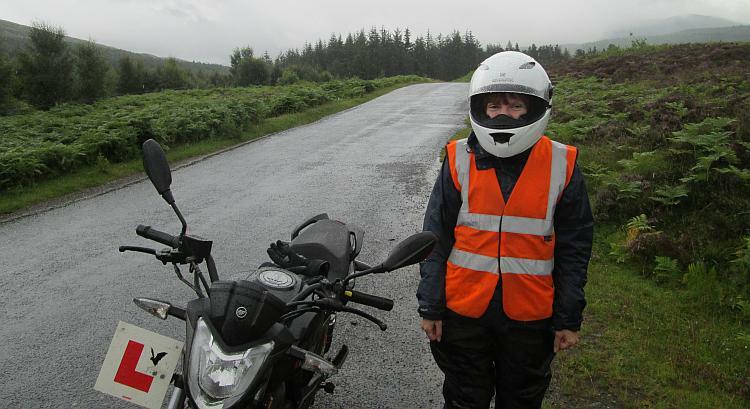 My days became an endless loop of "Don't forget your lifesaver...cancel your indicator...turn left at the traffic lights..."
A soggy learner (Sharon) enjoying the Highland weather. After 5 or 6 years earning a living on two wheels I had a minor crash that prevented me from riding for 3 months. In that time I came to accept I'd lost the passion for riding. Within a couple of months I started my - ahem - "career" in IT. We are all uniquely different. There are personalities out there who thrive and flourish working as a courier. There are people out there who revel in the satisfaction and challenge of turning a novice into a motorcyclist and preparing them for the world on two wheels. I enjoyed my time doing both of these jobs. I learnt a great deal about myself, about motorcycling and about people. I also learnt that for myself motorcycling for a living really took the pleasure out of motorcycling. I admire and greatly respect those that do it and more importantly stick at it, neither job is an easy job. Alas it wasn't the job for me though. Once I stopped riding motorcycles for a living I started to enjoy it once again. More recently - once I stopped trying to be fast I started to enjoy my motorcycling even more. I'm happy exploring back roads and chilling out in the countryside. Hmm all is not green and pastures new on the motorbike job front. It's a pity.. maybe running blood to hospitals might be ok well only if your a vampire. I think a lot of people who turn a hobby or passion into their career tend later in life to regret it for the simple fact that what they used to do for fun they now have to do whether they want to or not. And as with you it destroys their enjoyment of their passion. I was never a 9-5 type person and wanted to travel for free so I joined the merchant navy (the family "business" to be honest, though it was my 3rd choice of career)and have stuck with it for nearly forty years now. But my hobbies never had anything to do with sailing, unlike a lot of my colleagues. I did a bit of white water canoeing but my main enjoyment was shooting, rock climbing, hill walking and pot holing. Other than a ferry you won't get me near a boat. If I had become a professional climbing instructor or similar I would probably have hated it within a few years. I hate my job as it is but it doesn't interfere with my enjoyment of my hobbies when I am at home. Breaking bits of myself over the years and advancing age has restricted what I can do but I have added new enjoyments to the list, biking being one of them. It's odd how we romanticise some jobs. I thought life on the ocean waves would be all girl in every port and heroic adventures. I guess it's hard work, long hours and a bed that never stays still. It's a question of who you are Pocketpete. I figure there's plenty of couriers, instructors, mechanics and perhaps coppers who love their motorcycling related jobs.